Bihu, also known as Bohag Bihu or Rongali Bihu (ব’হাগ বিহু বা ৰঙালী বিহু) is the harvest festival of Assam. The festival of harvest will be celebrated on April 15 this year. 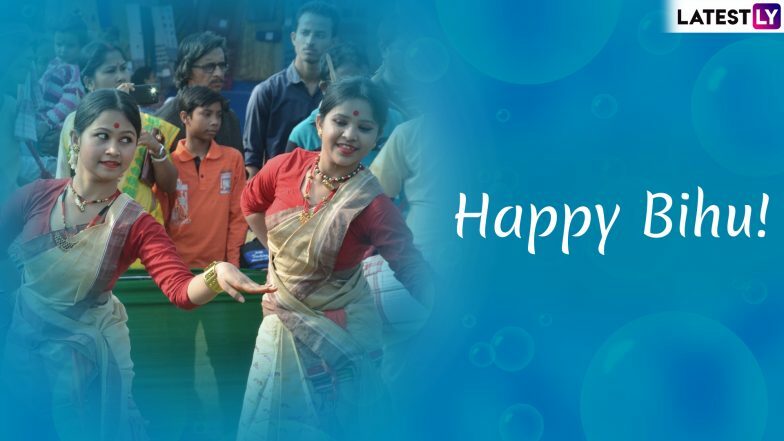 This auspicious day marks the shift in the Sun's solstice and marks the beginning of Assamese New Year. Bihu or Bohag Bihu is celebrated three times in a year, Rongali or Bohag Bihu during the month of April, Kongali Bihu in October, and Bhogali Bihu in January. Rongali Bihu 2019 or Bohag Bihu 2019 will be observed on Monday in India. 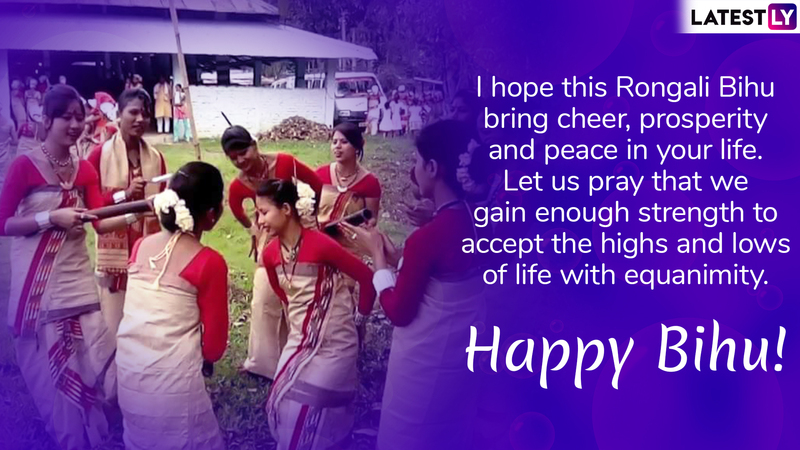 People wish each other Happy Bihu on this day. Nowadays, Bihu WhatsApp stickers, Rongali Bihu quotes and Bhogali Bihu images are often sent to greet on the festival. Bihu wishes are also sent through WhatsApp, Facebook and SMS. Rongali Bihu is observed alongside Baisakhi in Punjab, Poila Baisakh in Bengal, Puthandu in Tamil Nadu and Vishu in Kerala. The word Rongali is derived from the word 'Rong' which means happiness and celebration. And the word 'Bihu' comes from the Sanskrit word 'Bishu', which means to urge for prosperity from the Gods during important times like that of the harvest season. It is commonly believed that the festival received its name from two different words, 'bi' which means to ask, and 'hu' which means to give. Bohag Bihu 2019 Date & Significance: Know History Associated With the Seven-Day Festivity of Rongali Bihu. Bihu is traditionally a seven-day festival during which people worship cows, clean their houses, and pray and thank God for good harvest, blessings and prosperity. People wear new clothes, prepare traditional dishes on the day and visit their closed one to extend Bihu wishes. Meanwhile, farmers in Assam sow the fields for cultivation of paddy on this day. Bihu is celebrated with various cultural events including dance performances and folk songs in the state. 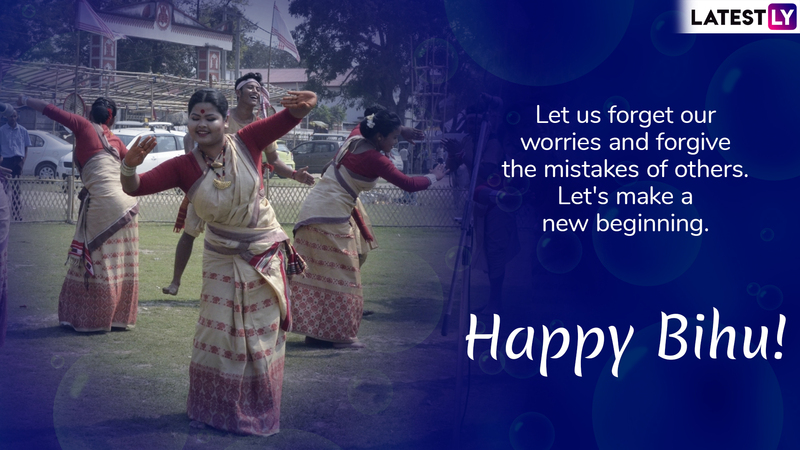 Meanwhile, we have compiled a list of Bihu 2019 messages and wishes you can send your friends, family and loved ones this festive season. Bohag Bihu Recipes 2019: From Tilpithe to Tenga Dal Here Are Traditional Assamese Dishes You Can Make to Celebrate Rongali Bihu. Message Reads: I want to wish you with oodles of joy and prosperity on this festival of harvest. Happy Bihu! Message Reads: I hope this Rongali Bihu bring cheer, prosperity and peace in your life. Let us pray that we gain enough strength to accept the highs and lows of life with equanimity. Message Reads: I wish your future brightens up with joy and happiness this festive season. 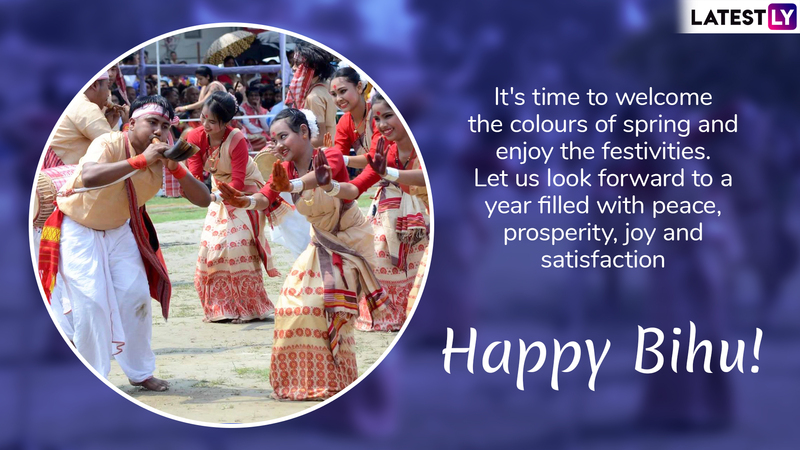 Happy Bihu! Message Reads: Let Bihu give you strength for whatever you have to face this year! 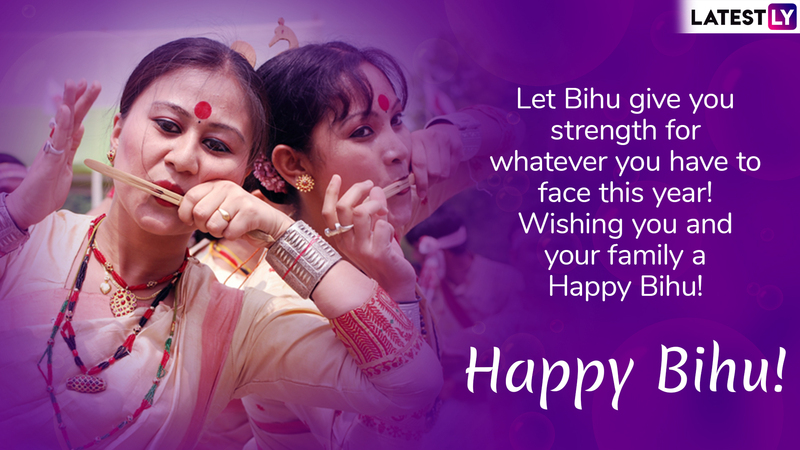 Wishing you and your family a Happy Bihu! Message Reads: May the music of Bihu songs usher in joy and the colours of Kopou phool (orchids) brighten your days. Enjoy the festive season. Happy Bihu! Message Reads: Let us forget our worries and forgive the mistakes of others. Let's make a new beginning. Happy Bihu! Message Reads: It's time to welcome the colours of spring and enjoy the festivities. Let us look forward to a year filled with peace, prosperity, joy and satisfaction. 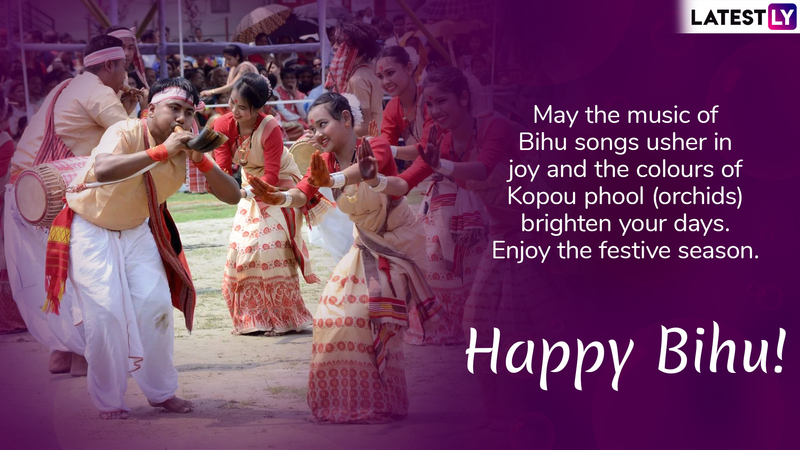 Happy Bihu! Bihu celebrations which begin on April 15 will continue till April 21. Feast, dance, music, and get-togethers will be the theme of the festival. Some of the traditional sweet dishes prepared on this day include pitha and larus that are made of rice and coconut. 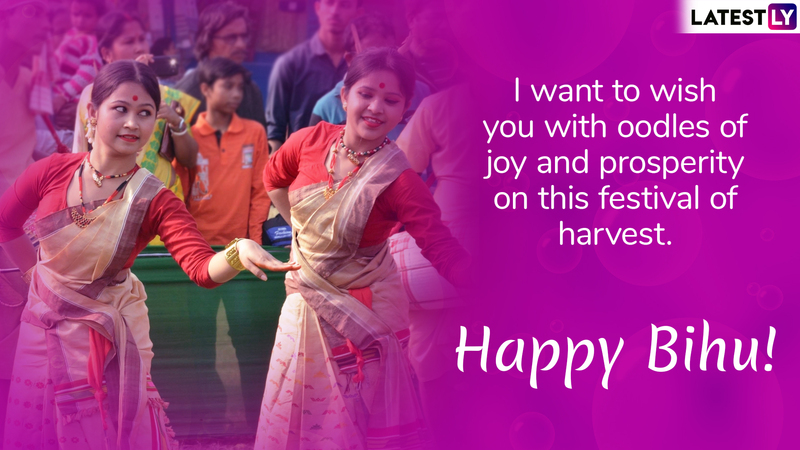 If you are away from your family this Bihu, send these beautiful messages to celebrate the day. We wish everyone celebrating a very Happy Bihu!